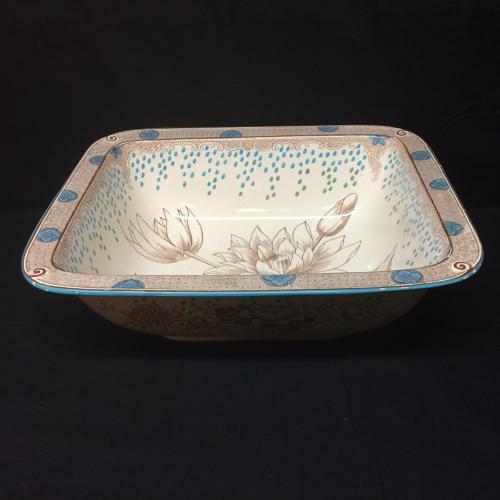 This Victorian foot bath is transfer printed in dark brown and further enhanced with turquoise. The printed transfer pattern features huge spectacular Lotus and Chrysanthemun flowers, a flying Egret and geometrical whimsies. Very unusual turquoise raining into the well of the piece. 16 5/8 inch long x 14 inches wide x 5 1/2 inches tall. The piece is in great condition, there are no chips, no cracks, no hairline and no repairs. A small amount of flaking to the paint on one corner. It is absolutely gorgeous - elegant and well potted, with richly detailed transfers reflecting the Victorian love of nature.